When you click “Install EmceePro” two things happen. First, you’ll see a label saying, “Copying EmceePro Back-up Files”. This process may take a minute or more. Once that’s finished, the installation process will begin. If things appear to have stalled, look for a SETUP button on the task bar at the bottom of your screen. Clicking on this button will help speed the installation. Begin installation of PracticePro by clicking the “Install PracticePro” button. Again, watch for the SETUP button on your taskbar. 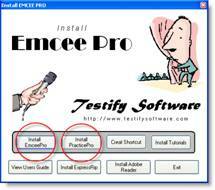 If this installation is an upgrade from an earlier version, and when you start EmceePro it looks like your programs have disappeared, we need to take one more step. Delete these two lines, save the file, and re-open EmceePro.